I know, I’m really cutting it close with this post, only being 3 days out from Thanksgiving. It wasn’t really something I had planned, it just kind of happened. 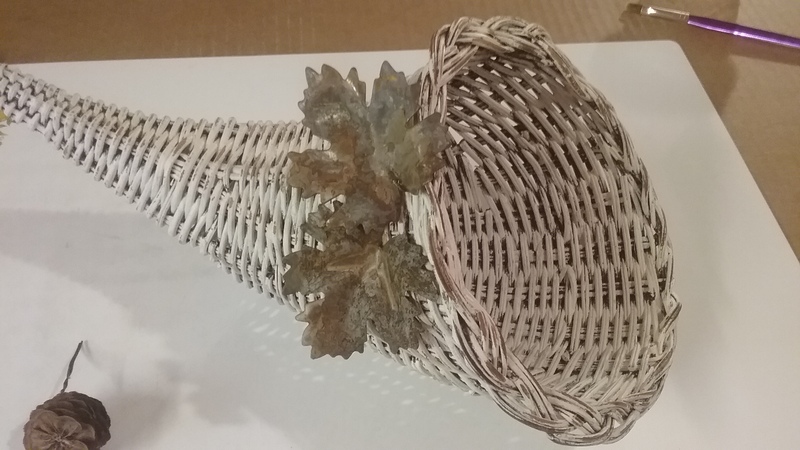 I was snooping around at my sister’s garage sale, last month, and found a wicker cornucopia in the “free” box. It made me smile as I remembered how excited my grandson, Kyle, was when he learned about them in preschool a couple years ago. He really got a kick out of saying the word and used it as many times as he could in conversations. We all got the biggest chuckle out it. Anyway, I grabbed it, with him in mind. I was thinking I’d just fill it with some tiny gourds and a little fall sprig, but just couldn’t get enthused about it. Then, as I walked past it on Friday (2 days ago), I thought about how my daughter loves to decorate for all the holidays. I decided to make it a gift. I’d snazz it up for her and fill it with treats for the kids. Now it had my attention ..
Not worrying about getting into all the nooks and crannies, it got a quick white paint job. 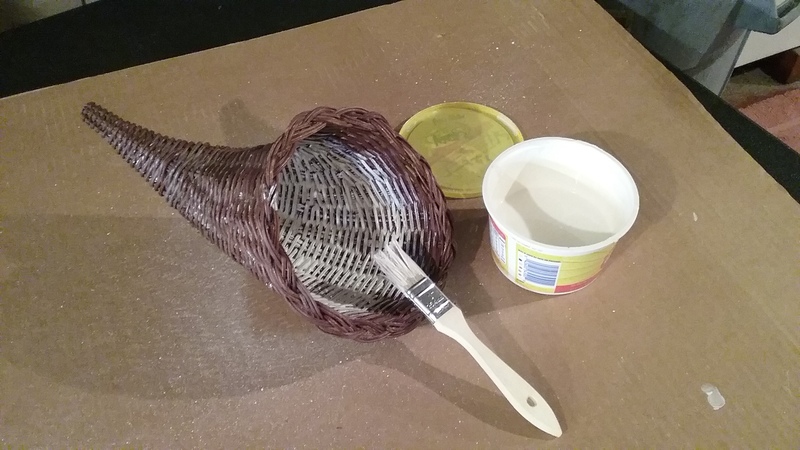 After it was dry, I sanded it lightly with some coarse sandpaper to remove a little paint for a worn look. 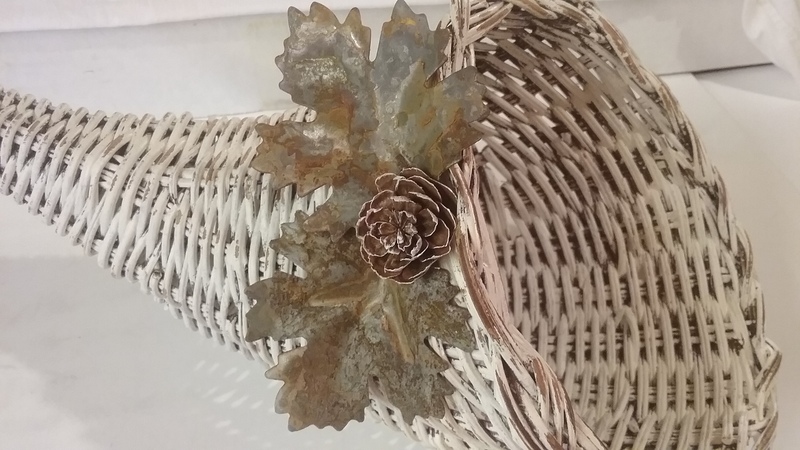 Not wanting to use a floral sprig, I opted for metal leaves that have been around here for ages. Looks like they originally came from Walmart, but I don’t know if that’s where I got them. 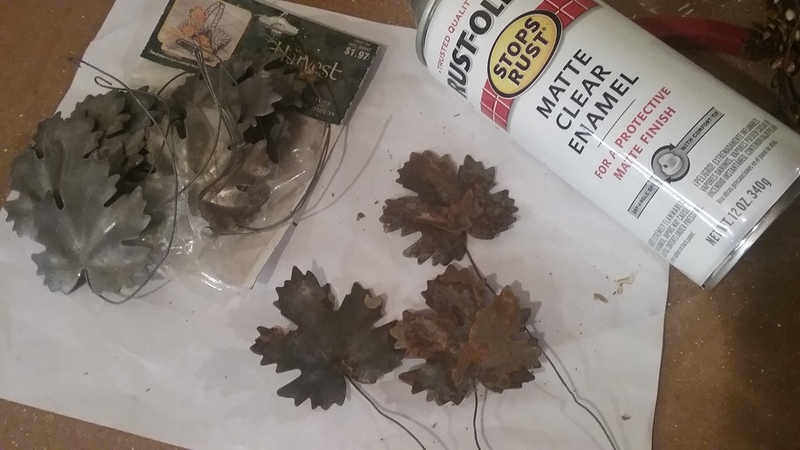 The leaves were too shiny, so I rusted them. I love the way they turned out. I sprayed them with a clear sealer to protect their new patina. 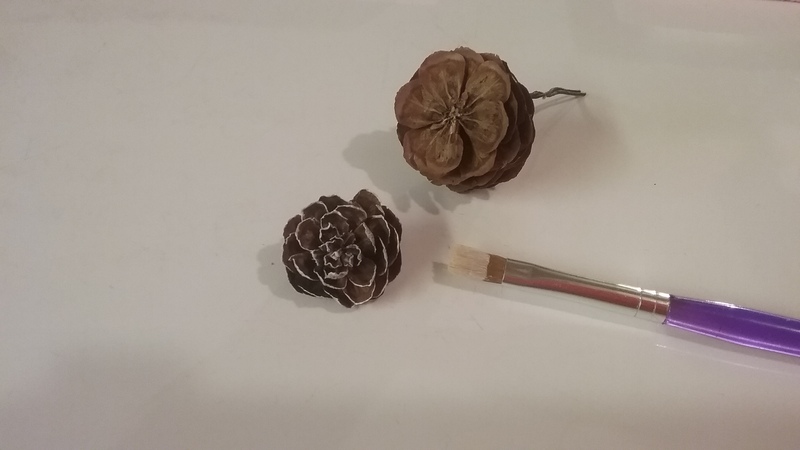 I clipped off the top of a pine cone to make a small pine cone flower, then highlighted the edges by dry brushing it with a little white paint. To keep it simple I only used 2 leaves. I trimmed back their wire stems, and wired them right to the wicker. A touch of hot glue holds the pine cone flower in place. Yep, I think my daughter will be pleased with this, and I’m sure my two favorite little people are going to love the filling!